Tierra del Fuego is an otherworldly place, with sometimes up to 20 hours of daylight, UFO-shaped lenticular clouds, and miles of inhospitable subantarctic forest. Jules Verne called it “The End of the World,” and the trip Gast just returned from was her second to the ethereal environment. She went to places only 4×4 trucks with experienced guides could navigate on an artist’s residency called Ensayos, a multi-disciplinary research project curated by Camila Marambio. The group also included two biologists, an anthropologist, and an archeologist. Two others from the group are representatives from South Florida as well: the anthropologist, Laura Ogden is an Associate Professor from Florida International University, and the archeologist, Melissa Memory, is the Chief of Cultural Resources for Everglades National Park. They too were there to interact with the landscape according to their professional specialties, and also understand the impact of the North American Beaver on the wilderness. Sixty-seven years ago, the Argentinean government was shipping the elusive beavers to Tierra del Fuego as a business experiment. After World War Two, fur prices were highly inflated. And hoping to take advantage of the rising pelt market, the government installed the beavers into the largely unpopulated forest. What they did not predict was the destruction the beavers would cause to the ecosystem. 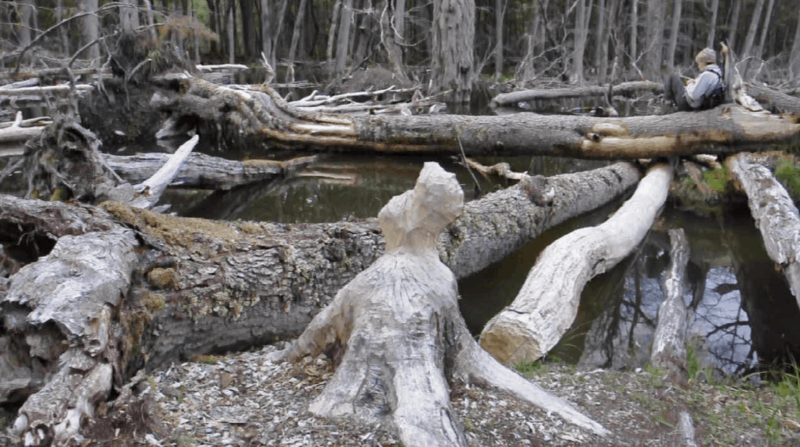 Due to the harsh climate, it takes a significant amount of time for the trees to re-grow, and the voracious beavers are chewing them up faster than the trees can regenerate. The Ensayos collective explored the landscape and most of their time was spent at beaver dams, in contemplative discussion. Under the direction of Memory, the group created an archeological record of the inside of an abandoned beaver dam and lodge. 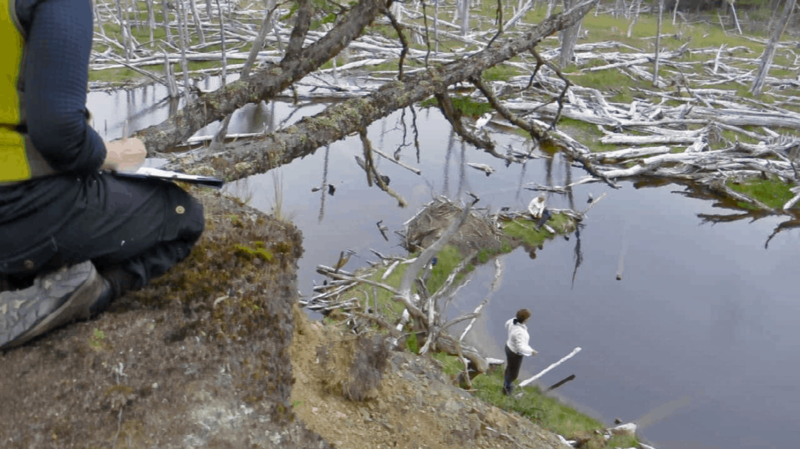 The group is working on a short film together about the beavers, and Gast herself is creating a series of sculptures inspired by the landscape and the unintentional assemblage of a beaver dam. The project is ongoing and there are plans to return over the next three years. The artist once did a project entitled Herbert Hoover Dyke (2010), where she tap danced around the Herbert Hoover Dike, a dam built during the Great Depression that completely encircles Lake Okeechobee and controls water flow through the Everglades. The beavers, and by extension the government who put them there, have forced their will on the landscape. It is the job of the biologists on the team to figure out what to do with a contested animal, and the job of the artist to look deeper. “This splash made it all the way to me,” Gast remarks as she reviews a video of a beaver smacking its tail on the frigid subantarctic waters. 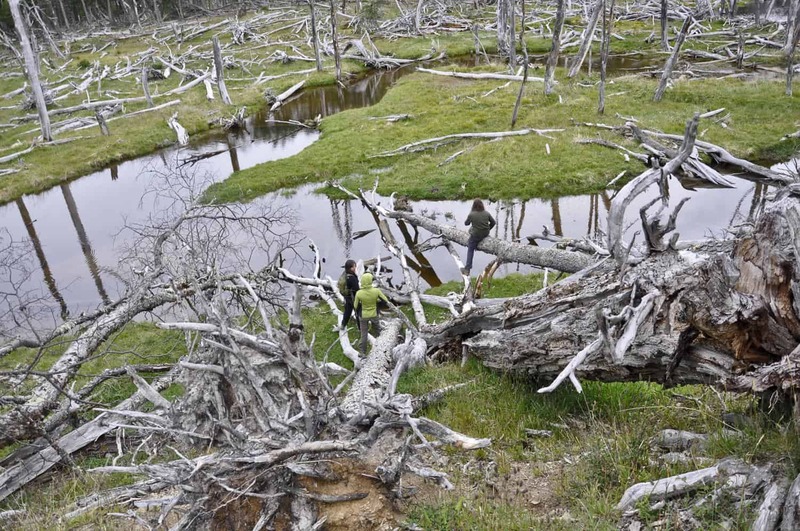 And the beavers made it all the way to Tierra del Fuego. And through their own practice, each of these three Miami-based thinkers hope to help solve a pressing ecological and ethical problem at the end of the world.